CritiCall and the Dispatcher Applicant: F.A.Q. . Ms. Freeman-Smith developed this for her personal use and as a resource for her blog readers. While CritiCall or Biddle Consulting Group did not participate in it’s development, applicants may find this to be a helpful practice tool. The CritiCall testing process will take, on average, between one and three hours to complete. Many people find that the test gives such a good, realistic job preview that—if they are not truly skilled enough for the job—they realize they simply are not cut out for this kind of work. The CritiCall program allows agencies and applicants to find the best match. Due to the stressful working environment, and the multitasking demands of the position, many agencies have found that new dispatchers quit the first week on the job after completing an in-depth and costly training academy. By offering the CritiCall tests not only are agencies able to determine whether or not the applicants are sufficiently skilled, but also applicants—themselves—are able to determine whether or not dispatching would be a satisfying career for them. Also, take a look at this video. One suggestion is to practice giving instructions to someone else from a very simple map. 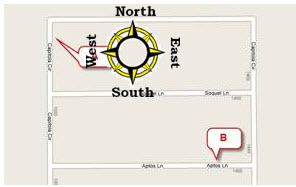 For example, using the terms “left” and “right,” as well at “North,” “East,” “South,” and “West” (as shown in the legend below), describe the quickest route from Point A to Point B on the map shown below. You can make up additional maps to practice at http://maps.google.com/maps. Note that the maps in the CritiCall test contain only very basic elements, such as streets, intersections, bridges, rivers, and railroad tracks. They do not contain more complete features such as contour lines (showing elevation). CritiCall is powered by Biddle Consulting Group, Inc. | © 2017 Biddle Consulting Group, Inc. All rights reserved.